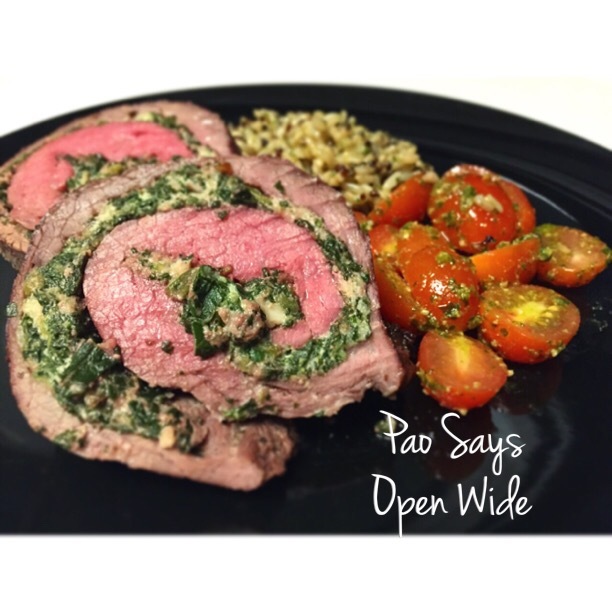 Going For A Spin: Spinach-Stuffed Flank Steak with Pesto Tomatoes and Wild Rice – Pao Says, "Open Wide!" I’m excited to say that this post is a part of the monthly link up party Our Growing Edge. This event aims to connect food bloggers and inspire us to try new things! This month is hosted by Jordan and Cindy at My Daughter and I . This is a great dish to make when having people over- it comfortably serves 4. It is pretty simple to make (the cooking is relatively fool-proof, since you’re just roasting), but it makes for an impressive presentation. It also doesn’t hurt that its incredibly tasty! 2. Lay steak on work surface. Holding sharp knife parallel to work surface and starting at a long side, slice flank steak in half to opposite long side, without cutting all the way through; open up the steak like a book. Flatten slightly to an even thickness. 3. In a small pan, sauté chopped onions, garlic, and mushrooms for a few minutes until garlic is fragrant. 4. Cook your frozen chopped spinach in a pot with 1/4 inch deep water and about a tsp salt (should take 5 min or so). Squeeze liquid from spinach; discard liquid. In medium-size bowl, combine spinach, cheeses, garlic and mushroom mixture, bread crumbs, egg yolk, 1/4 teaspoon each of the garlic salt and the pepper. 5. Season both sides of the steak with the remaining garlic salt and pepper. Press filling onto steak, leaving a 1-inch border on all sides. Roll up steak to enclose filling, beginning on a short side; the grain of the meat will be running from left to right (once the steak is rolled, the grain should be running length-wise to ensure its tenderness! ).Tuck any loose filling back into ends. 6. Tie steak with cooking twine at 2-inch intervals to secure, or pin it closed with toothpicks/short skewers. drizzle the steak with olive oil. 7. Roast at 425 degrees F for 25 minutes, then increase heat to broil and broil for 5 minutes. Let meat rest 15 minutes. Remove twine, slice and serve. The pesto tomatoes were really simple: just a handful of halved grape tomatoes and about 1 tsp pesto. (See my pesto recipe here). I like to make my pesto in bulk, and then freeze it in a small ice cube tray for later use in salads, pastas, marinades, or to kick up the flavor of rice! I added about a tbsp of my pesto to the wild rice I made, too, and it really made a difference in flavor. Definitely give these recipes a try. I can’t wait to make the dish again! This looks very impressive. Love the swirl shape of the spinach/beef. Are there any tricks for slicing the beef at the end? Does it stay together easily or want to fall apart? Nice tip! Thanks. I’ve never done any kind of rolled flank before so will keep this in mind. Of course! And you can get creative with your stuffings, too- once you try this technique, you’ll want to do it more and more!